Well, for a couple of hours they supported the President. Did anyone happen to read the fact check of our President's speech from CBS? And did you happen to notice today they had modified it? They go down the list, pretty much doing their normal (see https://www.cbsnews.com/live-news/trump-primetime-address-to-nation-speech-announcement-border-wall-fight-government-shutdown-today/) for the "corrected" fact check. But, there is something missing...CLAIM: The president claimed one in three women have been sexually assaulted traveling to the border. 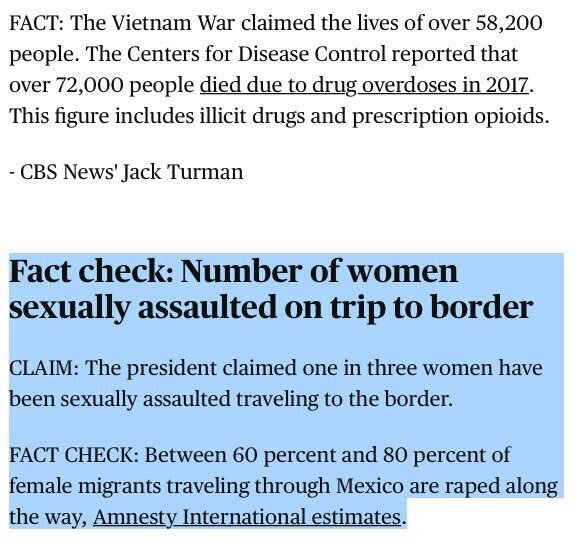 "FACT CHECK: Between 60 percent and 80 percent of female migrants traveling through Mexico are raped along the way, Amnesty International estimates.” Now why would they want to remove just this part? Perhaps their high ground is not that high?? Amnesty International estimated 60% but Fusion's report says it is more like 80%. Utterly shocking and very, very sad. Is there somehow America can help safeguard against this outrage? It is a difficult problem and one that most people do not understand. There is a history, most people do not talk about. In 2010 obama sent Jeh Charles Johnson, Homeland Security to meet with Representatives of Central America. What he did during that trip was to roll out a red carpet to anyone wishing to come to the US. During a secondary visit, he expanded the original invitation and announced: "The U.S. government is now offering an alternative, safe, and legal path to the United States, through our Central American Minors Program. To date, we have received more than seven thousand applications to this program, and we have approved more than 1,100 of these applications in El Salvador, Honduras and Guatemala. We are working to increase the number of individuals we are able to approve under this Program, and to further expand refugee processing in general in the region. https://www.dhs.gov/news/2016/05/22/statement-secretary-johnson-following-his-trip-el-salvador-and-honduras This drove the unaccompanied children and women with children problems. And reversing this "promise" to Central America will be difficult. Even if our President went in person... many will still attach their "hope and Dream" lines to what obama, and in particular Johnson promised. More simply put, people hear what they want to hear.... and disregards the rest. Thank you for this topic Penny. In my opinion this was the cause of much of POTUS 44's support and is the cause of much of the opposition to POTUS 45..
You are entirely welcome. I find it amusing that CBS would "correct" their fact check by removing the part that agrees with the President. Thank you for such kindness. I think, and I could be very wrong, but everything that happens is a result of what has already happened. If that makes sense. No doubt, obama had a "silver tongue." Or at least many thought so. As many know, I worked for the government and part of my job was to brief the Pentagon and the President as often as they needed or when something of "real" importance happened. By far, the most likable president was George (Jr). He was so personable and funny... Then obama came to power and I was called to brief him.. to put it bluntly, what you saw on the campaign trail and TV was showmanship. I found our encounter much less than productive as well as highly uncomfortable. From that point until my retirement... I prayed hourly to not have to brief him again...although I did.... each time it was like magnets--polar opposites I was physically and emotionally repelled by him and his wife (who thankfully, I only encountered once). I have never reacted that way to anyone in the past and have not since. Anyway, that is my personal side bar. I do not know how I would react to President Trump... I suspect that I probably would be able to get along with him. He is crass... rather boorish, but I think he may be personable and if one could get past his sense of humor or at least try to understand it, he might be clever and amusing. I don't think that most people have to try and guess where they stand with him. I also think he is much more intelligent that some give him credit. All I know is he appears to be doing what he was hired to do.... and I thank G*d daily that I am retired and can now judge from the outside of the DC swamp along with everyone else. By law, the border is always opened to asylum seekers wishing entry under due process. Of course entry is not guaranteed, so imagine the tremendous risk these migrants are taking. Maybe they will claim he lied because his figure was too low!